While her husband, Joe, was working, Heather Rio fell in love. The next day, Joe met the object of her affections. Even he knew that Heather was a goner. 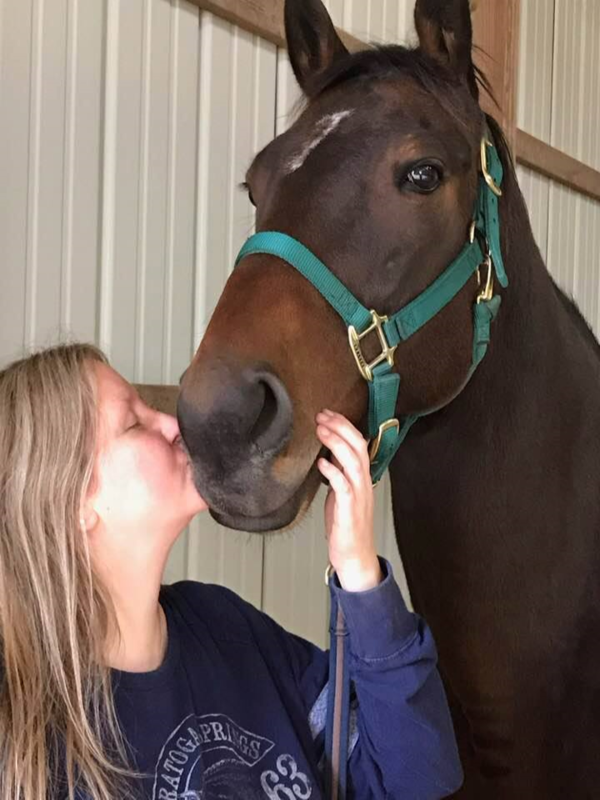 The 7-year-old retired Thoroughbred racehorse had only met Heather the previous day, but they had spent hours together. She had walked him, lunged him, and took her time grooming him. He took it all in. This, however, was the big day. Dusk to Dawn was to undergo a pre-purchase vetting from Dr. Morgan O’Brien of the Rood & Riddle Equine Hospital in Saratoga Springs, NY, and Dr.’s findings would be an important step toward the Rios adopting this bay son of Malibu Moon from the Thoroughbred Retirement Foundation (TRF). Dusk to Dawn was especially cool, but not aloof. He went along with whatever was asked of him and strutted his stuff for Dr. O’Brien as Heather and Dusky’s cheering section cooed “Good Boys!” and “Soooo Cutes!” to him at every turn. Dusk to Dawn was one of five former racehorses that were sent to Saratoga for the summer as ambassadors for the TRF’s internationally acclaimed Second Chances program. Second Chances teaches equine care as a vocation to prison inmates around the country while the inmates tend to the daily needs of Thoroughbreds no longer able to race. As stars of TRF’s weekly summer Open House, the five ambassador Thoroughbreds entertained visitors every Tuesday from 10 a.m. – 2 p.m.
Dusk to Dawn, along with Blown Save, Bold Mon, Cogs My Man, and Son of a Gun, vanned up for this purpose in late June from the TRF’s flagship Second Chances program at Wallkill (NY) Correctional Facility—which began in 1984, one year after the TRF was founded. The two and a half-hour ride from Wallkill ended at Heading for Home, a Standardbred rescue and re-training center between Saratoga Springs and Schuylerville, NY. Heading for Home generously worked with TRF to bring these horses upstate for the summer and make them accessible to the public. Within minutes of the horses settling in, a loud crash shattered the peace. A two-car collision on adjacent Rt. 29 left horses and humans unharmed but did serious damage to Heading for Home’s fence. The recent arrivals barely took notice of the noise and ensuing commotion, choosing instead to feast on the outdoor paddock clover grass and the apples and carrots provided by their new caretakers. From that point on, the quintet thrived under the care of TRF and Heading for Home. Dusk to Dawn quickly took to the new trappings. His disposition and grand looks immediately caught the attention of Heather Rio. Heather is a former lead underground utilities researcher while her husband Joe is a Damage Prevention Senior Supervisor for National Grid. Heather and Joe had only recently moved to Queensbury about eight weeks earlier from Miller Place on Long Island’s North Shore, bringing with them their Old English Bulldog, Muffin. Heather wanted a horse. Her father had been involved in rodeos on Long Island and in New Jersey and Heather had done some barrel racing when she was very young. She told Joe, after they had settled into their new home, she would be looking for a horse of her own. Once she learned that adoption was an option, Heather set her cap for Dusk to Dawn. She had picked out her birthday present. Now, he only had to be cleared by the vet. It took about a week and a half before Heather got the official notice that Dusk to Dawn was hers, and those days seemed to drag. All of her worries were gone when O’Reilly, with Dusk to Dawn in tow, pulled into Jeff and Kiersten Vroman’s Vertical Farm in Fort Ann. The 37-acre facility is home to about 70 horses, many of whom are off-track Thoroughbreds that the Vromans will re-train for other careers. Dusk to Dawn was home. Heather, of course, awaited him. Dusk to Dawn never finished better than second in eight starts on track. Now, he has the look of a winner. Dusk to Dawn is also part of the family at Vertical Farm. His buddy is another Thoroughbred named ‘emmy (short for Remington), but he also pals around with a quarter horse nicknamed Chex and another off-track Thoroughbred, Teddy. Heather walks Dusky every day around the perimeters of the paddocks to get him used to the place and to all of the other residents. She dotes on him at every opportunity. “He has been cleared by the vet to be ridden, so I plan to ride him someday,” Heather said. “There are trails and all back here, but for now, he’s just adjusting to everything. He is doing so well. He loves people, but he also loves being around other horses. He loves being busy. He is always looking around for something to do and he is always interested in what is going on.